Devi Durga in Hinduism is worshiped in different forms and considered a form of Shakti. 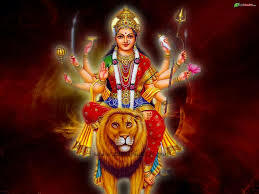 There are different reincarnations of Durga include Shakti, Kali, Gauri, Uma, Parvati, Chandi, Ambika, Lalita, Bhavani, Bhagvati, Java, Rajeshwari and other forms. The name “Durga” means the ‘invincible’ in Sanskrit. Devi Durga symbolizes freedom from all evils. The word Durga embodies freedom from all evils like injustice, cruelty, hatred, ego and other forms of pain and suffering. All the forms of Durga are worshipped in India. The legend goes that Durga was created by the Gods Brahma, Vishnu and Shiva to fight the demon Mahisasura, who could not be defeated by either man or God and was continually reigning terror on man and God alike. By killing the demon, Durga freed the world from the demon’s tyranny and has been known as the destroyer of evil since. 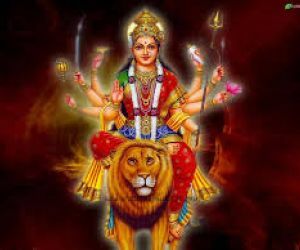 Durga is popularly depicted as a Goddess wearing red clothes, with ten arms and armed with weapons and a lotus flower and riding a lion or tiger. The red clothes signify fierceness in fighting evil, and the arms suggest that the Devi Durga protects her devotee from all directions.